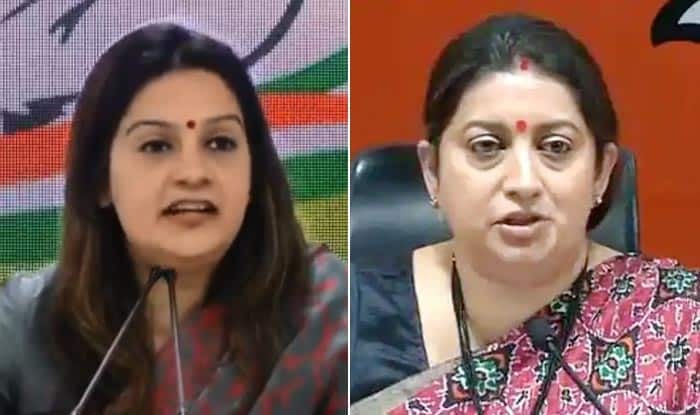 LS Polls 2019: Congress's Priyanka Chaturdevi lashed at Smriti Irani for not having a college degree. New Delhi: Congress leader Priyanka Chaturdevi on Friday hit out at BJP’s Smriti Irani over her recent revelation about not having a college degree. To attack Irani, Priyanka Chaturdevi borrowed the title song of the BJP leader’s single most famous serial ‘Kyunki Saas Bhi Kabhi Bahu Thi’. Chaturdevi said that a new serial was going to come, titled- ‘Kyunki Mantri Bhi Kabhi Graduate Thi’. The Congress leader added that the serial’s opening line would be “Qualifications ke bhi roop badalte hain, naye-naye sanche mein dhalte hain, ek degree aati hai, ek degree jaati hai, bante affidavit naye hain. (the minister was also a graduate once; the degrees are fiddled with and lied about in every affidavit)”. On Thursday, Smriti Irani accepted that she doesn’t have a college degree. In her poll affidavit, Smriti Irani said that she did enrol for an undergraduate course in Delhi University but did “did not complete the three-year degree course”. Irani said in her affidavit that she passed secondary school examination in 1991 and senior secondary school examination in 1993. She has said she did not complete her Bachelor of Commerce (Part-I), a three-year degree course, from Delhi University’s School of Open Learning in 1994. In August 2014, India had claimed in a media event that she had a degree from the prestigious Yale University in the US. This triggered a row with the Congress asking why she didn’t mention the same in her poll affidavit. For 2019 Lok Sabha elections, Irani is contesting from the Amethi Lok Sabha seat on BJP’s ticket, pitting herself against Congress president Rahul Gandhi who has won thrice from the parliamentary constituency regarded as a Gandhi family pocket borough.